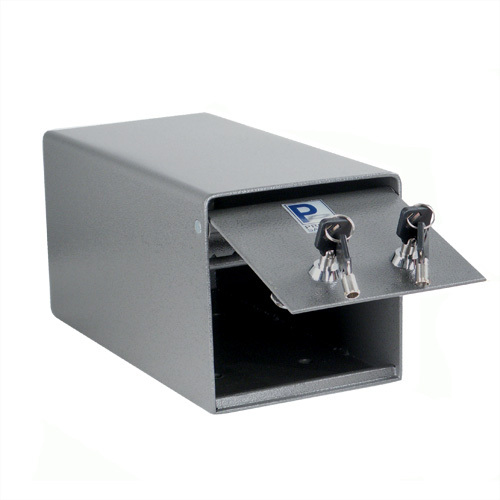 This drop box is identical in size to Protex's SDB-101 model, but offers two locks instead of one. Opening the box requires both keys, which offers an extra layer of operational security for anyone needing a basic drop box. Both locks are tubular steel locks having a "Double-D" conformation, though other cam locks can be substituted, and the 1/8" (3 mm) solid steel construction will discourage opportunistic burglars. Pre-drilled anchor holes and the included anchoring hardware also offer enhanced security. Great for personal use, in a home office, or in a business environment that doesn't require a full-sized depository safe. Shipping estimates available upon request.